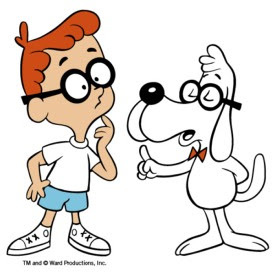 DON'T call him "Reverend Peabody" because the word reverend means holy, and no man is holy. DON'T believe those signs that say, "Smile God Loves You", because God does not love you. Negativity was the rule in Horace's church. He loved to call us wiggly maggots. He loved to point out how 99% of the rest of the preachers in the world were wrong. He loved to disparage any human effort to make the world a better place. According to him, the fallen world could never be improved by fallen man. The world was garbage. Man was garbage. Only God and Christ were good. Despite his negativity, or maybe because of it, Horace Peabody held a powerful grip on his followers. If someone on the street asked a member of our church which church he attended, chances are the member would say, "Horace Peabody's Church" instead of the actual name of the organization. Whenever the adults sat around discussing religion at home, Horace was held up as the ultimate authority. Whoever could quote Horace on a topic usually got to have the last word. If Horace said it, it was the truth. One afternoon my parents got into a huge fight because my mom had started listening to a different preacher on the radio. From my dad's reaction, you would have thought she had converted to Satanism. She had committed the unpardonable sin of doubting Horace, and my dad wasn't about to stand for it. Now I look back on the phenomenon of Horace Peabody and wonder why this one man had such power. True, he cut an impressive figure in his black suit and tie. He was tall as I remember, with jet black hair and a booming voice. There was a tragic mystique about him, as he had lost a son to the Vietnam war. His other son looked like Elvis Presley, a fact that was not lost on the girls in my Sunday School class. I don't remember him ever starting a sermon with a joke or an anecdote. Instead, he would ask a question or name a subject that he was going to talk about. Then he began to hypnotize the audience, building up slowly, like a symphony until you found yourself listening, not so much to the words, but to the rhythm. The content of the sermon was always confusing. It was all about SALVATION, and there were long lists of things that would not bring you SALVATION. These were fairly straightforward. You couldn't get it by being good or by being baptized or by "getting saved". Those were things that other preachers taught, and other preachers were wrong. But when he began to talk about what did bring SALVATION, the words he used made no sense. It was all this mumbo jumbo about sovereign grace through faith. On the one hand he seemed to be telling you that there was a specific thing you had to do in order to win God's favor. On the other hand, he seemed to be telling you that it did not matter what you did, you either had God's favor or you didn't, and it was all done at God's whim before you were even born. But somehow the whole setup was just and right and pure and holy. Welcome to Calvinism. I left that insane place when I was in my teens and I still dream about it 25 years later. Many of my family members still attend church there, and I pull my hair out trying to understand what draws them to it. Recent discussions on this site have given me some insight. While I doubt that anyone in Horace Peabody's church has ever been made to feel special for possessing a gift or a talent, my guess is that they all feel special to be included in God's so called elect. I don't suppose there is any earthly failure or shortcoming that couldn't be assuaged by the sure knowledge that you will be happy in Heaven while those who thought they were better than you are burning in Hell. Thank you to everyone who posts here. Your stories are fascinating and they are helping me get the foolishness of Christianity out of my system.